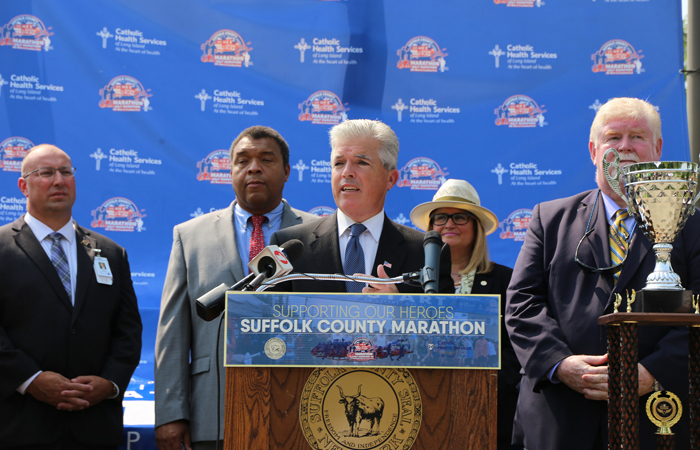 (Long Island, NY) Suffolk County Executive Steve Bellone today announced several exciting changes ahead of the Catholic Health Services 4th Annual Suffolk County Marathon, Half Marathon, 5K and Relay Race, which will be held on Sunday, October 28, 2018 in Patchogue. The changes for this year’s marathon include the event being dedicated to the members of the Air National Guard’s 106th Rescue Wing and the addition of the County Executive’s Cup. Suffolk County Executive Steve Bellone. Photo Credit: Suffolk County. In March, seven members of the 106th Rescue Wing of the New York Air National Guard in Westhampton Beach were killed when a U.S. helicopter crashed in Iraq; four of whom were from Long Island. In honor of the service members that were lost, this year’s race will be dedicated to the brave members of the Air National Guard’s 106th Rescue Wing. Each leg of the Relay Race will be specifically dedicated to one of the four Long Island members of the 106th that were killed in action, including Major Andreas O’Keeffe, Master Sergeant Christopher Raguso, Technical Sergeant Dashan Briggs, and Major Christopher Zanetis. Additionally, in honor of their memory, County Executive Bellone will be running with active duty members of the 106th Rescue Wing. Members of the 106th will be participating in both the full marathon and the relay race to honor their fallen airmen. This year’s race will also feature a County Executive’s Cup, which is a new trophy that active duty military personnel who participate in the Full Marathon are eligible for. The trophy will be awarded to whichever Military Branch finishes with the top score overall and will have their division name engraved into it. The winners will then be able to take the trophy back to their base until next year’s race. In order to participate, there must be a minimum of five people per branch, and they must be registered for the full marathon. Scoring will be calculated by adding the placement numbers of each runner together, and for each additional runner that crosses the finish line after the first five initial runners, five points will be deducted, with a maximum deduction of 25 points. The team with the lowest score will be awarded the County Executive’s Cup. The trophy has been generously donated by the Ronayne Family. All four races begin and end in vibrant downtown Patchogue. The marathon course travels through numerous other scenic downtowns on the south shore as well, which are Blue Point, Bayport, Sayville, Oakdale, and Great River. The full marathon course will turn around in Heckscher State Park before entering the scenic Bayard Cutting Arboretum in Great River. The half marathon turns around on the former St. John’s University campus (now Amity Education Group campus). After turning around in their respective locations, both the full and half marathons travel back down Montauk Highway to their starting point in Patchogue. The 5K will travel on Montauk Highway to Blue Point before turning around. In addition to the races being held, the FreedomFest will begin at 9:00 a.m., shortly after the first 5k runners finish and just before the first Half Marathoners will finish. The event will feature three stages of live musical entertainment and include more than 40 vendors that will highlight local craft breweries, award winning wines, and local food and produce. The street festival will include many family-friendly events, including pumpkin painting, lawn games and other fun activities. The Suffolk County Marathon was first launched in 2015, with the main objective of providing additional support to the more than 90,000 veterans who reside in Suffolk County. Each year, the Marathon raises money to benefit veterans and to date, the Suffolk County Marathon has raised more than $400,000 for local veterans’ services with more than 9,000 runners participating. Last year’s recipients included, Paws of War, Long Island Cares, America’s VetDogs, St. Joseph’s College, Make it Count, United Veterans Beacon House, General Needs, and the Association of Mental Health and Wellness. For more information on the Marathon, Half Marathon, 5K and Relay Race or to register please visit www.suffolkmarathon.com.